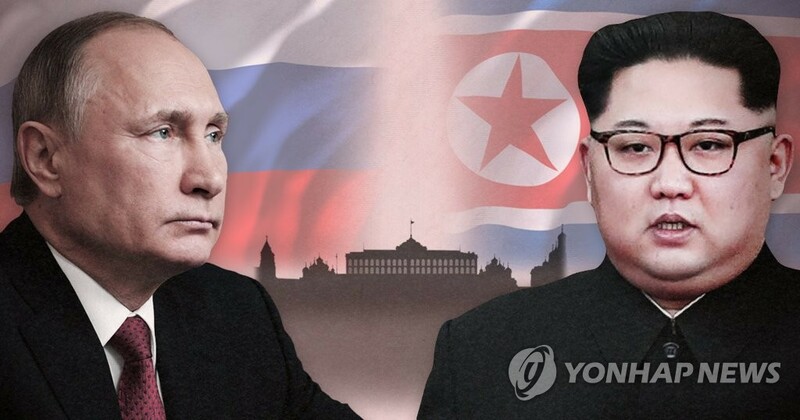 SEOUL, Oct. 12 (Yonhap) -- North Korean leader Kim Jong-un and Russian President Vladimir Putin have exchanged messages to celebrate the 70th anniversary of the establishment of bilateral diplomatic ties, Pyongyang's state media reported Friday. The North's official Korean Central News Agency (KCNA) carried two separate articles introducing the content of the messages that stressed the "constructive" partnership between Pyongyang and Moscow. In his message, Kim said that North Korea-Russia relations have developed based on the "principle of mutual respect, good neighborliness and mutual benefits," and that this tradition has invariably been carried on in the new century. It also expressed hope that the relations would continue to develop steadily and constructively in line with "the requirements of the new era and the interests of the peoples of the two countries." Putin's message also pointed out the continuing development of bilateral relations. "For the past decades the Russian Federation and the DPRK have accumulated lots of experience in the course of constructive cooperation in various fields," Putin said in his message. DPRK is the acronym of the North's official name, the Democratic People's Republic of Korea. His message then expressed the conviction that the two sides would further strengthen all reciprocal relations, including the three-party program with South Koreans. It did not elaborate on the program. "This, without doubt, complies with the interests of the peoples of the two countries and will contribute to strengthening security and stability on the Korean peninsula and overall Northeast Asia," Putin said in the message. The exchange of messages came as the North was apparently seeking support from Russia amid ongoing denuclearization negotiations with the United States.